The B7Bingo Hall Management System (HMS) is the most advanced hall management system available to Bingo Halls. The HMS will manage everything from issuing VIP Players cards to player tracking, employee tracking, inventory (pull tab & paper) tracking and even hot check management. B7 HMS takes the hassle out of paperwork and automates everything from player birthday prizes to employee timeclocks and even sales tax reports. With its unique web-based software, it can run on almost any computer with an internet connection. The HMS was designed by former bingo hall employees with simplicity in mind. The system is easy to use and your customers and employees will love it. Have multiple halls? No problem!! Combine the halls into one system and let your customers share points across your halls. Your customer retention will go through the roof! Collect valuable information on your players while tracking their visits to your halls. The HMS gives you the ability to combine points across multiple halls, keep notes on players, create special customer groups and even generate W2-Gs at the end of the year. Taking checks doesn’t have to be a gamble. Track hot checks written and your hall and generate automatic collection letters. You can even track payments or permanently ban customers from writing checks. Open hot check lists can be easily printed from the report menu. No more errors on your pulltab inventory. Simply scan your inventory in when your distributor drops it off and scan it out when you play it. No more missing pulltab boxes. You can view your inventory and costs across multiple halls and keep track of what tabs are selling. The HMS makes it easy to track your daily concessions and retail sales. No more messy excel spreadsheets, the HMS will help you minimizes theft and control your costs. With automatic sales tax calculation and reports, end of the month tax payments aren’t a surprise. Let your players sign up for instant text message alerts using your unique shortcode. Send text blast to your players alerting them of specials, promos, or just reminding them to come play bingo. Your players can even check their point balance via text. Get rid of your messy timecards and employee files. Scan and upload your employee documents for safe and secure storage on the cloud. 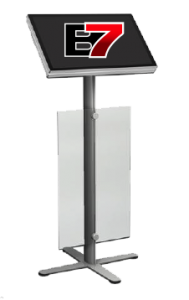 Once your employees are setup they can clock in and out using the HMS kiosk at your bingo hall. Upgrade your bingo hall with our digital signage player. Turn your ball camera televisions into a dynamic digital advertising platform. Upload and manage your advertising slides from within the HMS system – advertise your bingo games or even sell spaces to outside businesses. 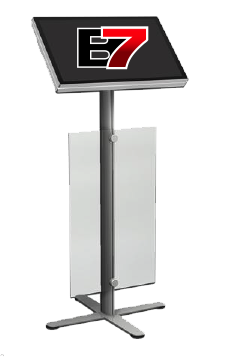 Put your VIP players in the spotlight with integration into the B7Bingo Video Entertainment Display. With the press of a button, quickly display any VIP players in the hall celebrating their birthday. Player will love seeing their name on the video wall! Everything that goes into the HMS can also come out in nice, easy to read reports. Easily print bad check lists, concession sales, time clock reports, sales tax reports, inventory reports and even player reports. Managing your bingo halls has never been simpler.